As we know, many legitimate threats go unnoticed and with the unsurprising high volume of alerts and your team spending far too much time in infrastructure setup or BAU tasks, you need a solution that empowers your existing SecOps team to see the threats clearer and eliminate the distractions. That’s why we reimagined the SIEM tool as a new cloud-native solution called Microsoft Azure Sentinel. Azure Sentinel provides intelligent security analytics at cloud scale for your entire enterprise. Azure Sentinel makes it easy to collect security data across your entire hybrid organization from devices, to users, to apps, to servers on any cloud. Collect data across your enterprise easily – With Azure Sentinel you can aggregate all security data with built-in connectors, native integration of Microsoft signals, and support for industry standard log formats like common event format and syslog. Analyze and detect threats quickly with AI on your side – Security analysts face a huge burden from triaging as they sift through a sea of alerts, and correlate alerts from different products manually or using a traditional correlation engine. Automate common tasks and threat response – While AI sharpens your focus on finding problems, once you have solved the problem you don’t want to keep finding the same problems over and over – rather you want to automate response to these issues. When creating a VM in the Public Cloud, some would think that the Provider would be responsible for its security. Guess what, you are responsible for its security. A common misunderstanding is assuming that a strong password would do the job of securing the VM access. To prove that is not good enough, yesterday I created a VM in Azure for a Containers Lab work and in less than 9hrs, I had 8712 failed login attempts as it shows in the picture above. So, what should you do to protect the access to my public VM? “Password-less VM”: Using SSH public key, instead of password, will greatly increase the difficulty of brute-force guessing attack. A username that is not standard such as “root” or “admin”: Azure already help you with that, by not allowing you to create “root” or “admin” as a username. Also note that in Linux, the username is case sensitive. No password for the user; no password-based login permitted. Instead, configure Private key/certificate SSH authentication: That’s a must! A randomized public SSH port. Check out the Quick steps: Create and use an SSH public-private key pair for Linux VMs in Azure article on how to configure those steps. Configure Security Policies, which drives the security recommendations you get in Azure Security Center. Allowed source IP addresses- The IP ranges that are allowed on this port when a request is approved. Maximum request time– The maximum time window during which a specific port can be opened. Configure dedicated network connection between your on-premises network and your Azure vNets, either through a VPN or through Azure ExpressRoute: Production services should not be exposing SSH to the internet. In the past, when working with partner organisations where you were invited to access shared resources or applications, in order to get your access removed/revoked you would need to contact their Global Admin and ask them to remove you. That was not an easy task! When a user leaves an organization, the user account is “soft deleted” in the directory. By default, the user object moves to the Deleted users area in Azure AD but is not permanently deleted for 30 days. This soft deletion enables the administrator to restore the user account (including groups and permissions), if the user makes a request to restore the account within the 30-day period. If you permanently delete a user, this action is irrevocable. These highly-requested capabilities simplify and modernize your collaboration. They also empower your partner users and help you with your GDPR obligations. New Azure B2B Invite process. 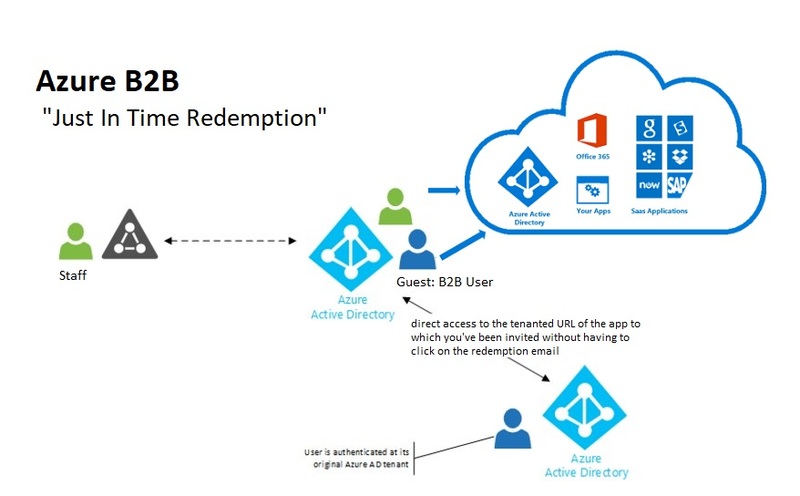 In the past, in order for your guest/partner users to access a shared resources utilising Azure B2B Collaboration, they would have had to be invited by email to access resources/apps on your Azure Tenant. When receiving the email, your guest/partner clicks on the invitation link which will trigger its acceptance and consequent adding the guest/partner account as a guest user in your tenant and the providing access to the resources or apps you have configured. Now, although that option still available, your guest/partner users can simply access the application you’ve invited them to. How? 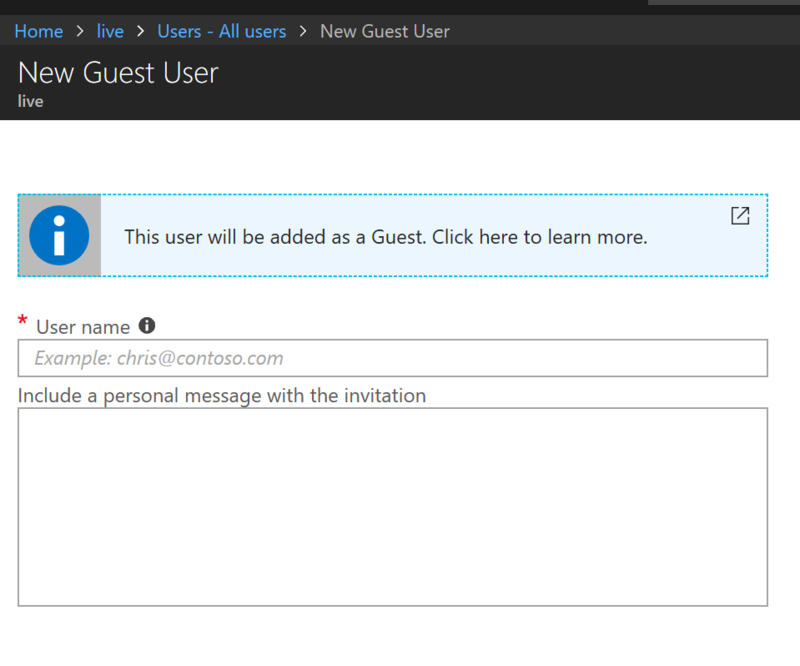 You can invite a guest/partner user by sending him/her a direct link to a shared app. NEW Modernized Consent Experience. When a guest/partner user accesses your organization’s resources for the first time, they will interact with a brand new, simple, modernized consent experience. After any guest user signs in to access resources in a partner organization for the first time, they see a Review permissions screen. Upon consent, the guest/partner users will be redirected to the application shared by you. Now, your guest/partner user will only have to click on the link to the application to immediately access it after giving consent. It’s very simple isn’t it? Fundamentally, Containers are an isolated, resource controlled, and portable runtime environment which runs on a host machine or virtual machine and allows you to run an application or process which is packaged with all the required dependencies and configuration files on its own. When you containerize an application, only the components needed to run this application and of course the application itself are combined into an image, which are used to create the Containers. How are you utilising containers? Do you have questions on Containers? On Tuesday, 24th April, Microsoft Program Manager Ben Armstrong, will be answering your questions on Containers. It is a rare opportunity. Don’t miss out. You can also ask questions through twitter until Tuesday by including #AskBenArmstrong. Now, you can debug fstab error on a Linux VM for example, with direct serial-based access and fix issues with the little effort. It’s like having a keyboard plugged into the server in Microsoft datacenter but in the comfort of your office. Serial Console for Virtual Machines is available in all global regions! This serial connection is to COM1 serial port of the virtual machine and provides access to the virtual machine and are not related to virtual machine’s network / operating system state. All data is sent back and forth is encrypted on the wire.All access to the serial console is currently logged in the boot diagnostics logs of the virtual machine. Access to these logs are owned and controlled by the Azure virtual machine administrator. You can access it by going to the Azure portal and visiting the Support + Troubleshooting section. Serial Console access requires you to have VM Contributor or higher privileges to the virtual machine. This will ensure connection to the console is kept at the highest level of privileges to protect your system. Make sure you are using role-based access control to limit to only those administrators who should have access. All data sent back and forth is encrypted in transit. Access to Serial console is limited to users who have VM Contributors or above access to the virtual machine. If your AAD tenant requires Multi-Factor Authentication then access to the serial console will also need MFA as its access is via Azure portal. For Linux VMs: this capability requires no changes to existing Linux VM’s and it will just start working. In the left menu, select virtual machines. Click on the VM in the list. The overview page for the VM will open. Scroll down to the Support + Troubleshooting section and click on serial console (Preview) option. A new pane with the serial console will open and start the connection. Note: For all platform images starting in March, Microsoft have already taken the required steps to enable the Special Administration Console (SAC) which is exposed via the Serial Console.